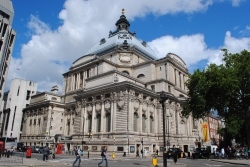 The return for 2013 of our series in which we ask you to identify where in London this picture was taken. If you think you can identify this picture, leave a comment below. We’ll reveal the answer early next week. Good luck! Thanks for the comments Parktown but this ship is not in Rotherhithe nor does it have anything to do with Lloyds! This is part of the decorative scheme of Chelsea Bridge which crosses the Thames between Chelsea and Battersea Park in London’s west. Initially known as Victoria Bridge, the first bridge here opened in 1857 (Albert Bridge, which opened later, is located further west). But increased traffic eventually led to its demolition in the 1930s (it had been renamed some years earlier to avoid the association of a royal name with a bridge which had become structurally unsound) and the current bridge, the first self-anchored suspension bridge (that is, the suspension cables attach to the deck and don’t extend to the ground) in Britain, was opened on the site in 1937. 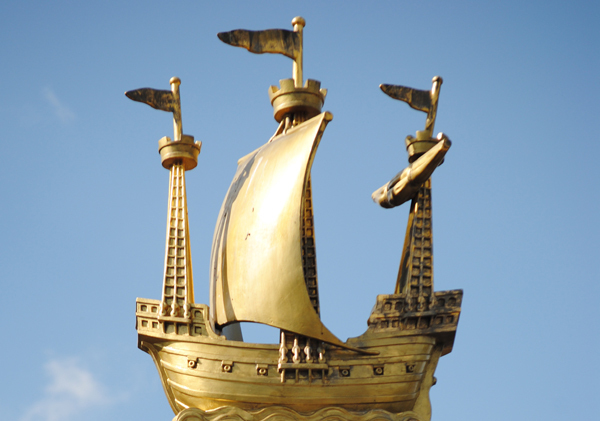 This gilt galleon sits atop a decorative lamp post at the bridge’s entrance (there are several) and below it is the coat-of-arms of the now defunct London County Council.